We recently hit 1,000 fans on our Facebook fan page. So to celebrate this small achievement, we asked some of our favorite producers if they had any music that they felt like donating, as a gift to our audience. The first one up is Ratchet. He's scheduled for a Memekast in the near future. But for now he offered up one of his most recent creations. It's a bangin' tune full of wobbles, bleeps and bloops. 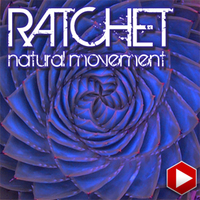 "Natural Movement" contains some of the most solid call and response work from Ratchet, to date. With catchy lead lines and bumping, grinding bass work that moves the song along the whole way through. And then, there is that half-time breakdown... It's almost enough to make you want to lean back to the right, with your lip sneared and be all like "Uuuuungh!" if you know what I'm sayin'. This free giveaway also comes out just in time to give support to Ratchet's new album "Warp Speed" which comes out on Ooze System Recordings. Warp Speed will be unleashed upon Addictech.com January 2nd, 2012. Just click the "Buy" button to Download the track.